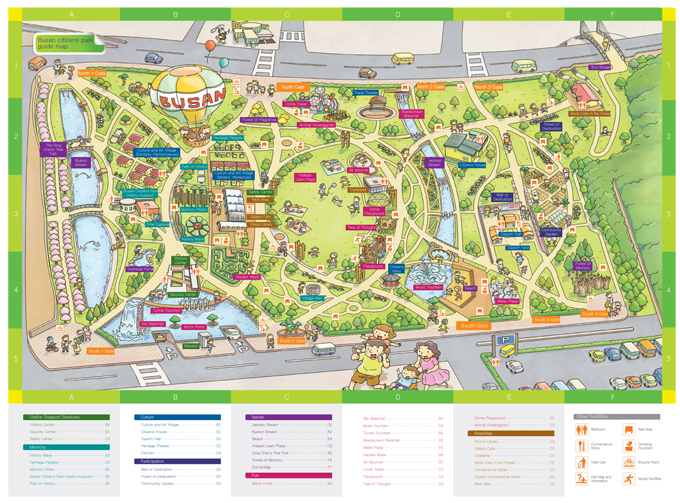 Busan Citizens Park was established under the five themes of Memory, Culture, Pleasure, Nature and Participation. As a new style of park, it provides people with a comfortable, healing environment that is full of possibilities. The park has over one million trees including 97 different species (46 species of forest trees and 43 species of bushes). The park’s facilities include an information center, a park history center, a 490-meter-long stretch along the Bujeoncheon Stream, a 450-meter-long stretch along the Jeonpocheon Stream, four fountains, six squares, nine play areas, parking lots, cafes, convenience stores, and restrooms. The City of Busan is striving to make Busan Citizens Park a world class destination for not only the city’s residents and Koreans but also for people from around the world. During the park’s construction, heavy consideration was paid to making it a barrier-free zone. This included making the park’s entrances, restrooms, gardens, and information boards easily accessible to people of all ages. The park obtained a preliminary Barrier-Free Certification in February 2014 from the Korea Land and Housing Corporation, and is scheduled to receive its Barrier-Free Certificate. Busan Citizens Park aims to be the first ubiquitous park in Korea. For the safety of visitors, CCTVs (42 smart crime prevention CCTVs, 50 general CCTVs) have been installed and monitor every corner of the park 24 hours a day. Any emergency situation will be reported to the park management center, the fire station and the police office. The park’s state-of-the-art technology not only provides free internet access around the clock, but also enables visitors to quickly scan conveniently located QR codes attached to each tree to easily obtain information on that particular species. The condition of major trees in the park is systemically managed by RFID technology. The park has also incorporated IT technology at the Visitor Center with the installation of a 4D theater and play area for children in addition to the Wall of Dedication. By employing “Crime Prevention Through Environmental Design (CPTED), Busan Citizens Park guarantees the safety of all park visitors. CCTVs installed at every corner of the park allow security personnel to immediately respond to emergency situations and report to the relevant authorities and emergency services. Busan Citizens Park is alcohol-free and smoke-free to provide a pleasant environment for all. Busan Citizens Park is a natural healing space inside of the city. Over one million trees including different 97 different species, along with walking paths themed with Memory, Culture, Pleasure, Nature and Participation, two ecological streams (Bujeon-cheon, Jeonpo-cheon), as well as forests and ponds that provide visitors with a pleasant chance for rest and relaxation. Take local bus No. 33, 44, 63, 83-1, or 179 and get off at Busan National Gugak Center Bus Stop. Take Metro Line No. 1 to Bujeon Station and leave by Exit No. 5 or 7.